The above-ground tanks at the refinery serve as the temporary, downstream staging point for the crude oil that has traveled to this location via pipeline, rail car, truck tanker or ocean vessel. Apart from crude oil arriving via pressurized pipeline, all of the other aforementioned Transportation methods will require process pumps to unload their cargo and to transfer it to the Storage tanks. This crude oil inventory will support the smooth and around-the-clock operation of the refinery. Tank Loading systems handle this task. As user experience bears out, seemingly simple services like Tank Loading systems can offer their challenges. Stripping rail cars and tanker vessels demands that the pumps regularly operate under very difficult inlet conditions with tight NPSH / NPIP margins, often managing vortexed air that has entered into the supply manifold due to low submergence of the takeoff connection fitted to the side of the tank below the tank liquid level. Depending on the regularity of the crude oil supply chain, these systems may be operated intermittently, demanding the repeated starting and stopping of drivers and pumps, increasing the potential for an unplanned discharge of process fluid. Refinery production managers and operators around the globe have experienced the benefits that volumetric, rotary PD pumps can bring to these services. Having one machine that can efficiently transport heavy, medium and lightweight products simplifies the number of pieces of fluid-handling equipment required at these facilities. 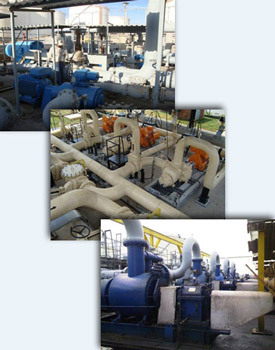 Controlling the rotary PD pumps with an adjustable speed drive allows operations to be performed in a "timed" manner without the need for flow control valves, eliminating the need for the recirculation of surplus process fluid. This reliable system control method takes full advantage of the tremendous turndown flow range of rotary PD pumps and their inherent high suction lift capability, making them an ideal fluid-conveying solution for your tank loading systems.